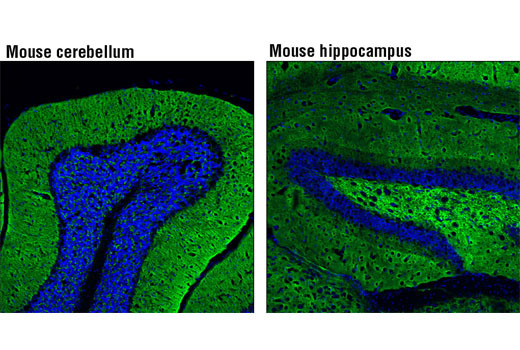 Confocal immunofluorescent analysis of normal mouse cerebellum (left) and hippocampus (right) using Synapsin-1 (D12G5) Rabbit mAb (Alexa Fluor® 488 Conjugate) (green). Blue pseudocolor = DRAQ5® #4084 (fluorescent DNA dye). Synapsin-1 (D12G5) XP® Rabbit mAb (Alexa Fluor® 488 Conjugate) detects endogenous levels of total synapsin protein. The antigen is 100% conserved between human synapsin-1a and synapsin-1b.